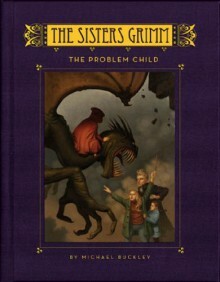 The Sisters Grimm come face to face with their parents kidnappers and are stunned when one of them happens to be the world's most famous fairy-tale character (hint, she wears red) and the other an unstoppable killing-machine known as the Jabberwocky. Without the now-dead Mr. Canis at their side, the girls have little hope that they'll ever be reunited with their mother and father. That is until their long-lost Uncle Jake returns home with stories of a weapon that can kill the beast but is so powerful it had to be destroyed. Now the girls must find the missing pieces so the deadly weapon can be reforged, but to get it done they'll have to go head-to-head with the Wizard of Oz, the Little Mermaid, and even the horrible witch Baba Yaga. To complicate matters, Sabrina begins to struggle with an addiction to magic and finds herself unraveling a real-life family mystery, the origins of which have caused suffering for generations of Grimms.